We received some new drawings before CVS takes this to the city council. There is a short review at the June 20, 2016 Land Use & Zoning Committee meeting at 6pm at Sprague Library. Since this has already gone through the planning commission we have no report to offer. New comments can be sent directly to council.comments@slcgov.com. 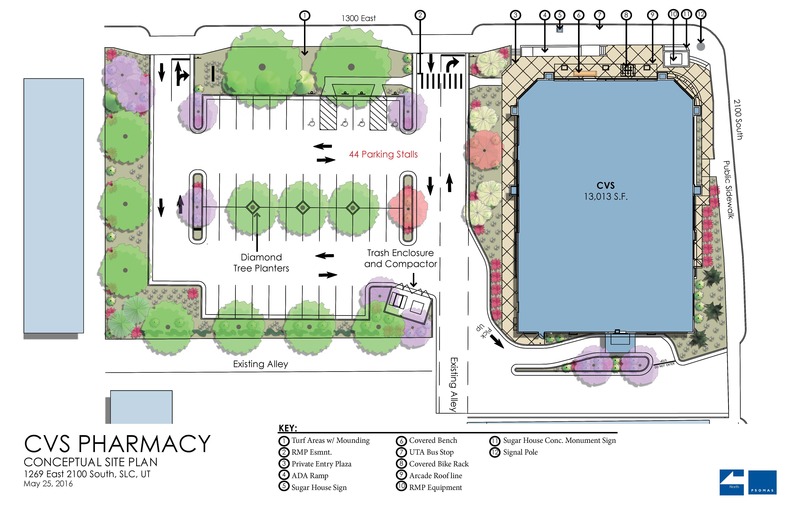 CVS has revised their concept in an effort to get a positive recommendation from the community to rezone for a smaller number of parking stalls on the property north of the corner parcel. 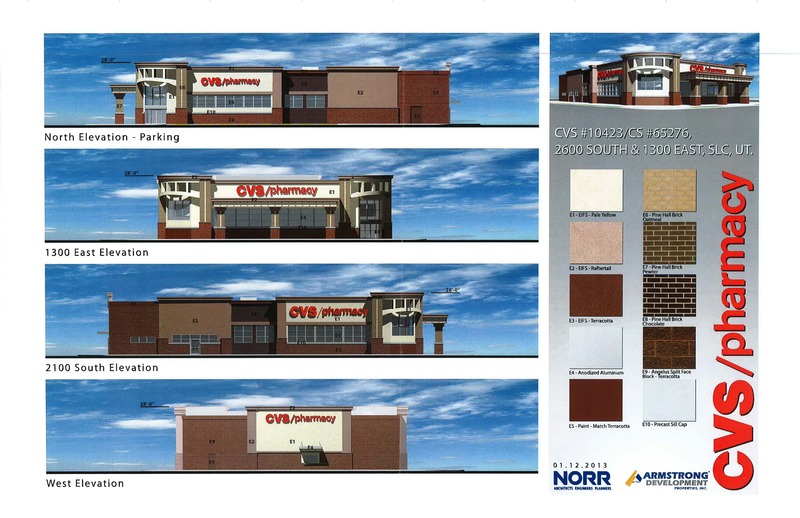 CVS also has a plan to just redevelop the corner parcel, which would basically be an over-the-counter permit as it would meet all existing ordinances should this plan fail to find approval. This project was presented to the Salt Lake City Council to approve the rezone. The city council sent CVS back to do some redesign of the building and delayed vote on the rezone. This project was presented to the Salt Lake City Planning Commission May 27th, meeting starts at 5:30pm. The Planning Commission made some changes to the parking area and approved the project. One part of this project will now go on to the Salt Lake City Council and that is the request for a rezone of the lot located north of the current car wash. The planned CVS pharmacy building did not require a rezone and is an accepted use under Salt Lake City Zoning Ordinance. We will post here once the item is scheduled on an agenda. The public is welcome to comment directly to council.comments@slcgov.com and attend the meeting to give a public statement. CVS Pharmacy has completed their presentation to the Sugar House Community Council. We are awaiting to hear when they are scheduled for the planning commission. Check back for notification on this public meeting. The following is the beginning of what the SHCC will send the Planning Commission regarding the proposed CVS Pharmacy. These documents become public record and we will present comments at the meeting. Every member of the public is welcome to attend and give their own comments. February 4, 2015 meeting at Sprague Library 7-9pm. If you are interested in learning more and participating in the process please attend. Your feedback, comments and participation help create a better community. You can leave a comment below.